A ball game activity that combines exercise with stimulation of conversation and reminiscence about topics that relate to men. 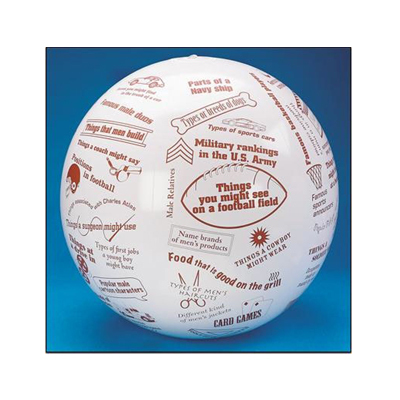 This beach ball sized inflatable conversation ball has 86 topics appropriate for a men’s group to share as they toss or pass it about. When the ball is caught or picked up by the player, he must list possible answers related to the statement directly under his thumb. Eg. types of first jobs a young boy might have, things you might see in a barber shop. Note: Though an American product, only 6 of the 86 topics can be considered American specific and can be adapted to suit. All the rest are suited to your male clients. Balloon pump required for inflation – sold separately.